Are Russian and U.S. militaries secretly coordinating operations in Syria? Regardless of whether that January sortie took place or not, the Russian military is ready for "unprecedented cooperation" with the Pentagon. 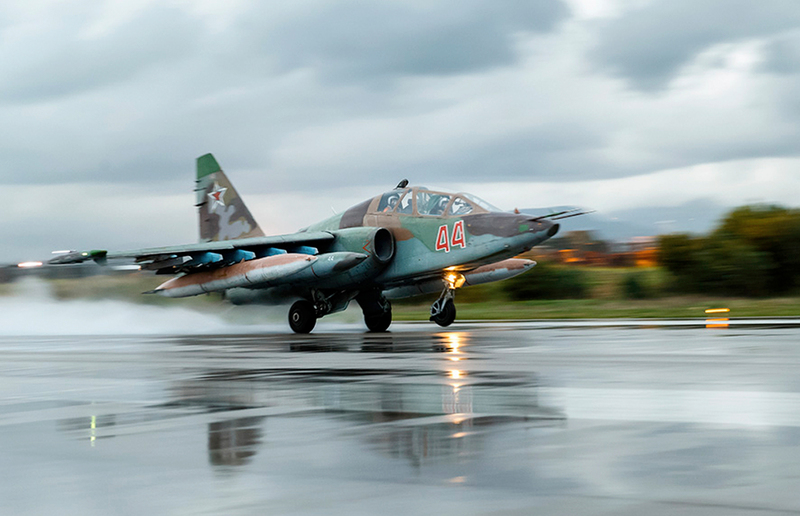 Photo: Su-25 ground attack jet takes off at Hemeimeem air base in Syria. After years of the Obama Administration's unwillingness to fight terrorist groups in Syria, the new American president shows a greater desire for his country to join Russia in the war against Islamist terror organizations. Rumors of a coordinated Russian-U.S. military operation in Syria began to circulate in Jan. 23 when the Associated Press reported a joint strike against terrorist positions. The Pentagon denied the report, but the Russian Defense Ministry reported (in Russian) a combat mission on Jan. 23, though there was no mention of cooperation with a foreign military. Despite the denial, the business magazine Vlast reports (in Russian) that on Jan. 22 the U.S.-led international coalition headquarters in Amman (Jordan) contacted the Russian air group in Khmeimim via a direct line. During the call, the U.S. military gave the Russians the coordinates of targets in Al-Bab (Syria). According to Vlast, soon after the American data was received the Russians confirmed it and then two Russian military aircraft took off to bomb terrorist forces in the designated area. The real surprise came, however, when the Russian bombers were joined by two Belgian aircraft operating within the international anti-terror coalition in Syria. Regardless of whether that January sortie took place or not, the Russian military is ready for "unprecedented cooperation" with the Pentagon, wrote Vlast. Will 'friendly' fire deaths in Syria dampen Russian-Turkish relations? "Unprecedented cooperation" includes direct exchange of intelligence, coordination of targets, and even "interaction on the ground during special operations," Vlast wrote. But the Russian military has one condition - "[we] need guarantees at the highest level," Vlast reported, quoting an unnamed source in the Russian military. Even without a breakthrough in U.S.-Russian relations, coordination between the Russian and the U.S. militaries has improved dramatically since the telephone conversation between President Putin and President Trump on Jan. 29, said Colonel (retired) Viktor Murakhovsky, reported Vlast. In their first telephone conversation in November, Putin and Trump focused on the issue of combating terrorism. "Putin and U.S. President-elect Trump did not touch upon the issue of sanctions, focusing instead on anti-terrorism issues," reported Vlast. Vlast sources said that if the Russian side had raised the issue of lifting the sanctions, it may have been seen as a sign of weakness, especially on the part of Putin personally, and so there was no point pursuing that issue. The Kremlin wanted a dialogue on equal footing, which is what Moscow was unable to get from Washington under the Obama administration. Fighting the Islamic State and Jabhat al-Nusra is acceptable for both Putin and Trump, wrote Vlast. The fight against these terror groups will be the main topic during the first Putin and Trump meeting. Currently, coordination between the Russian and international forces in Syria is made on the basis of a memorandum on the safety of flights over Syria, which calls for flight regulations, communication channels and managing crises, but nothing more. That said, Vlast's sources in Russian diplomatic circles insist that Moscow has no illusions regarding relations with the new president. "There have been too many difficulties, too many obstructions deliberately put up by the previous administration in the path of developing our relations," said Russian Deputy Foreign Minister Sergei Ryabkov, reported Vlast. "Efforts continue by destructively-minded forces to effectively tie the hands of the new U.S. administration, to hobble it, so that it won't make a single step forward in terms of improving relations with Russia. We already see that."